Size: 6.8" x 3.2" x 0.6"
Texas Instruments announced in May 2007 with the TI-30XS MultiView the improved version of its long lasting TI-30X IIS introduced already in 1999 and slightly redesigned in 2004. In some European countries, e.g. Germany, Switzerland, and United Kingdom, with the TI-30XB MultiView a battery only powered replacement of the original TI-30X IIB hit in July 2007 the store shelves. In France an otherwise identical TI-30XB MultiView sports a wonderful green housing. 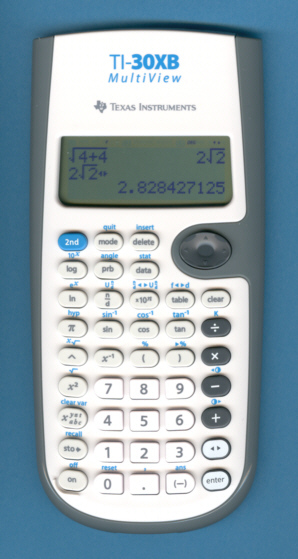 Instead of the previous 2-line display the TI-30XB MultiView features a dot matrix display with 31 * 96 addressable pixels allowing the calculator to display equations as they would be printed in a text book. In addition to this so called "MathPrint" mode the calculator sports a TI-30X IIB compatible "Classic" mode. Dismantling the TI-30XB MultiView reveals a pretty common construction with two printed circuit boards (PCB's). The main PCB hides the single-chip calculating circuit under a small protection blob of black epoxy and drives the graphing display with a heat sealed fine-pitch connector. The keyboard makes use of a much simpler second PCB and a heat sealed connector, too. The prominent SR-21B designation on the main PCB proves that this calculator was manufactured by Kinpo Electronics, Inc., a famous company located in Taiwan and doing calculator production for well established companies like Texas Instruments, Hewlett Packard, Casio, Canon and Citizen. Don't miss the TI-34 MultiView and the TI-Collège Plus. Stokes Publishing Company, Inc. based in Sunnyvale, California sold a companion for the teacher, view the wonderful TI-30XS MultiView Overhead Calculator. Find here the original press release dated May 9, 2007. © Joerg Woerner, June 11, 2007. No reprints without written permission.